HELLO NB , WELCOME TO THE 4TH ANNUAL CHUCK WAGON EXTRAVAGANZA. 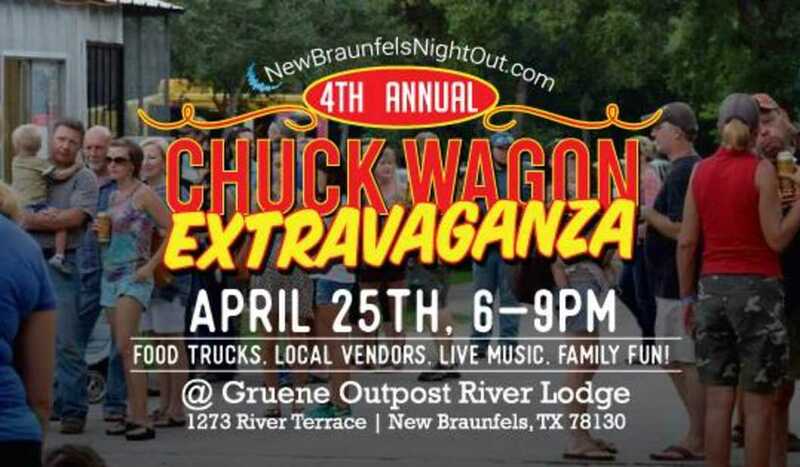 On April 25th, we are welcoming back all of NB, some local food trucks, and some great local music all next to the Guadalupe River at Gruene Outpost River Lodge. We have always tried to make this event family oriented, and strive to do that again. Few things in store this year, we made it to our 4th, got to kick it up some :D Please come and enjoy this event with us, New Braunfels. This years food trucks are as follows: Cajun on da Geaux, LLC, Grouchy Mama's, Road Dogs NB, FM31FOODTRAILER, and Tikiz of Hill Country.